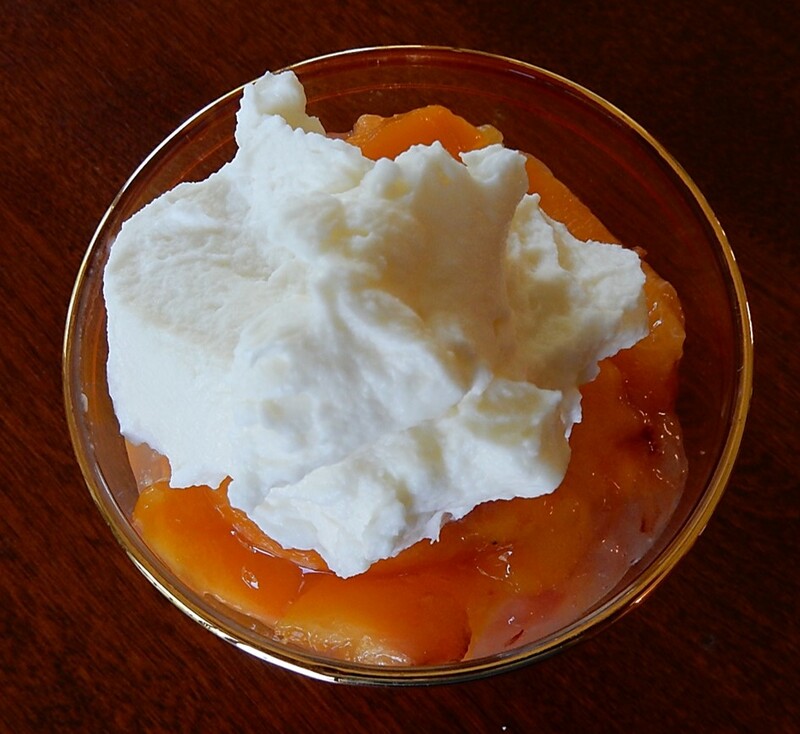 I recently found a hundred-year-old recipe for the perfect peach dessert – Peach Tapioca Without Cream. The name is a bit misleading. This luscious, refreshing dessert is topped with almond-flavored whipped cream. The peaches are embedded in a delightful, thick, sweet, tapioca sauce made with water, sugar, and lemon. The use of water rather than the usual milk or cream creates a lovely new dimension that’s unlike any tapioca I’ve ever eaten. This recipe was published in Good Housekeeping in 1917. At the time, food prices were rapidly rising due to food shortages cause by World War I. 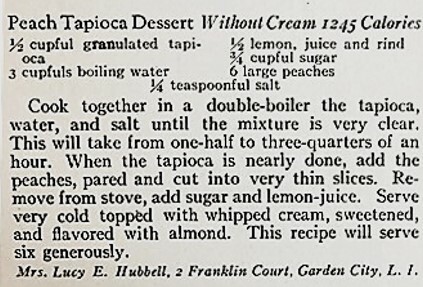 Cream was expensive – so the recipe called for making the tapioca with water instead of cream. But apparently the recipe author couldn’t bring herself to totally eliminate the cream and decided that people could afford to use a little cream that could be whipped into a delightful topping. Combine the tapioca, water, and salt in a large saucepan; bring to a boil using medium heat while stirring constantly. Reduce heat and simmer gently while continuing to stir; cook until the mixture is clear and thick (about 20 minutes). Remove from heat; stir in the lemon juice, grated lemon rind, and sugar. Added the sliced peaches and gently stir to combine. Put into a bowl and refrigerate until thoroughly chilled. Serve with Almond-Flavored Whipped Cream. Put cream in a bowl; beat until stiff peaks form. Add confectioners sugar and almond extract; beat until combined. Posted on August 6, 2017 August 12, 2017 by SherylPosted in FoodTagged dessert, peach, recipe, tapioca. I really liked how this recipe turned out, and it is perfect for hot summer days. Huh, I didn’t know that about the cream, but it makes sense! And it is peach season…. This really is interesting. I wonder if fruit juice could be substituted for water? It would open up even more possibilities, like apples and raisins with an apple juice/tapioca sauce. Put some cream and chopped nuts on top of that, and you’d have a nice dessert for the fall. mmm. . . I’m getting hungry just reading your suggestion. I definitely think that fruit juice would work well with the tapioca. I hadn’t thought about it until you mentioned using peach jello; but, you’re right, the consistency and taste would be similar. This will be handy in a few months, when the peach tree between our house and the neighbour’s is bearing fruit. Thanks. There you go again, feeding me delicious forbidden sugar through my eyes. Looks so yummy. Yummy! I must try this. I doubt if any of your British readers of a certain age will try this. Sadly, we were force-fed tapioca pudding on a weekly basis at school dinners, and all of us, wherever educated, have deeply unhappy memories of the much-reviled ‘frogspawn’. This article puts it top of the list of hated school foods. https://www.theguardian.com/education/2003/aug/06/schools.uk1. Seriously, should we give it a second chance? You should give it a second chance. How could anyone like a food with the nickname of ‘frogspawn’? Thanks for sharing the link. I enjoyed reading about the most hated school foods. I was surprised to see blancmange on the list. Recipes for it are in hundred-year-old cookbooks, and I once made a recipe for Chocolate Blancmange; but it’s not a food that I ever hear of today in the U.S.
I’m a bit hungry at the moment and feel as though I could gobble that right up, delicious! It’s tasty. I think that you’d like it. This looks and sounds delicious Sheryl! I’ve never worked with tapioca. I do love peaches, though. What a lovely dessert. You should try tapioca. It’s an ingredient that isn’t used much today, which I think is a shame. It can be used to create some interesting and tasty desserts.